before Baba's mahasamadhi the land was bought by a Bombay devotee, M. W. Pradhan, and later presented to the Sansthan. At the end of 1999, Lendi Gardens was radically re-landscaped, and the previously paved and tree-lined area turned into lawns with a waterfall and flower beds. In Baba's time, Lendi was an area of wasteland between two small streams, the Lendi and the Sira (now dried up). Baba used this area for toilet purposes. He would leave the mosque for Lendi around nine o'clock in the morning accompanied by some devotees. However, none was allowed inside with him except Abdul Baba. Apart from answering the calls of nature here, Baba seemed to enjoy going to Lendi and sometimes went several times a day. This was the place where he spent time in solitude. It was a particular characteristic of Baba's that once he had started something, it became a strict and lifelong routine. For example, though initially devotees forced him out of the mosque into the Chavadi because of heavy rain, he continued his routine of sleeping there every other night as long as he was alive. Similarly, after his arm was burnt in the dhuni, it was dressed and tended by Bhagoji Shinde; the wound healed and Baba lived for a further eight years, but the practice of Bhagoji changing the bandage every day continued until the end. Showing a similar regard for routine, Baba always took the same route whenever he went to Lendi from Dwarkamai. A fakir will sometimes take up strict adherence to a routine as a practice, as it is supposed to reduce the opportunity for personal preference, and hence development of the ego. Baba had no need for any practice, but he seemed to maintain the routine anyway. His route to Lendi was not the most direct or obvious, yet he stuck to it unswervingly. Perhaps we will never know what his reasons were, but just as Baba used to go along with a few devotees, let us also walk with him and take a short stroll to Lendi. Gurusthan. Halfway along this path, the route kinks right and then immediately left. 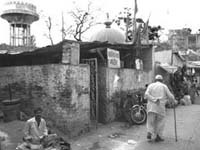 Baba would often pause at this corner, which was where his devotee Balaji Pilaji Gurav lived. A small shrine enclosing a pair of padukas now marks the spot where he would stand. Baba would sometimes also stop further down the lane and stand in a similar posture to the god, Vittal. There is now a Vittal Temple in that same place.